*This post contains affiliate links. For more info see my disclosure policy. You can see our curriculum from last year here. Our main curriculum is My Father’s World. We purchased the deluxe package, so everything we want in a kindergarten curriculum is included. 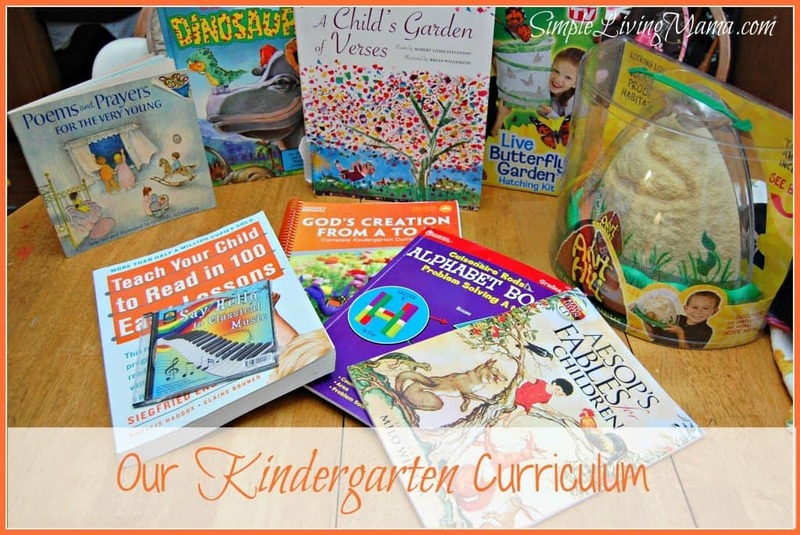 We will be doing math, phonics, science, and many other things with this curriculum alone! I’m excited! I will break down some of the elements of the curriculum for you, as well as show you the other things we plan on using this year. Besides doing the math included with MFW, we will also use the Cuisenaire Rods Alphabet book that came with our MFW package for extra, hands-on math skills. I may use Teach Your Child to Read in 100 Easy Lessons. I’m still undecided. It really depends on how well I like what is included with MFW. I have tried this with Bug before, but we stopped when I realized he wasn’t ready for it. Along with the butterfly garden, ant hill, and various other activities included with our MFW curriculum, we will continue to do nature studies outside. We love pointing out everything we discover in nature! Bug really loves to draw, so he will enjoy illustrating his findings. We are using Say Hello to Classical Music, which is included with MFW. I plan to follow the book list in the back of my teacher’s manual to the best of my ability, but I am also including poetry from A Child’s Garden of Verses and Prayers and Poems for the Very Young. We have a book of Aesop’s Fables with a CD that I will play for him when I want him to hear different fables that correlate with the units in our MFW kindergarten. I’ll probably get into how I’m incorporating these things in a different post so I can show you exactly what we are doing. We will also read short chapter books as our before bed read aloud. I plan to do another post with our list of read alouds for the year, so be on the look-out! Draw Write Now book 1 for him to try. I hope he really enjoys it! Come Look with Me: Exploring Modern Art for the kids so I can introduce them to some masterpieces and they can develop a sense of art appreciation. I bought the Toddler package from My Father’s World to use with both Sis and Bug. It includes lots of hands-on learning toys like Wedgits, Stacking Pegs, and a fun shape sorter. So, that’s our basic plan this year! We can’t wait to get started! Hoppin’ by from Weekend Whatever link-up. It looks like you all will have lots of fun this year! We’re still a ways off from kindergarten, but I enjoy seeing what other mommas are choosing for their littles. Thanks so much for stopping by, Kayla! I love Teach Your Child to Read in 100 Easy Lessons! I used it with my six children. They all love to read : ) It was challenging at times I will say but worth it. I hope you enjoy your journey with it.